Designed to deliver performance versatility, The SOG B66N-CP is an ergonomically styled multi-tool with a durable black oxide finish made of industrial grade construction. Both the full-serrated and one straight-edge blade on this multi-tool can be opened using only one hand with a thumb stud quickly and safely, thanks to its SOG Assisted Technology high tension coil spring components. When not in use, the locking mechanisms fitted with the blades lock closed using a patent-pending side release, whereas when in use, the blades will lock into place when in the open position. Weighing only 9.3 ounces and equipped with a cloth carrying pouch, the SOG B66N-CP delivers job-specific tasks with compound leverage for enhanced wire cutter and plier function. 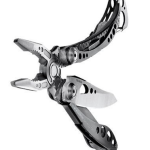 It includes everything a DIY enthusiast or a professional contractor would need when carrying out projects or tasks, including a V-Cutter which allows the user to generate twice the hand cutting pressure and gripping power than rival multi-tools; consequently, a user can smoothly slice electrical cable sheathing, paracord, fishing line, seatbelts, etc., effortlessly. The stainless steel handles on the SOG B66N-CP provide comfort when doing the toughest duties. 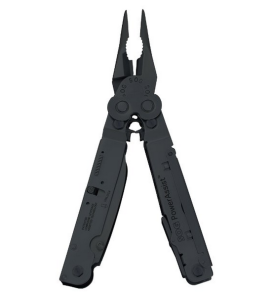 Although this multi-tool features gear covers and hex bolts it is lightweight and portable with dimensions of just 5.5 x 1.6 x 2.9 inches. As with other SOG products, the SOG B66N-CP multi-tool is backed by a lifetime warranty that protects it against defects in manufacturing and materials. The Compound Leverage technology of the B66N-CP employs multiple pivot points that produces better handle transference in relation to plier action. Plus, the SOG Assisted Technology used with both the blade and tools protects the user from injuries and allows for safe storage. 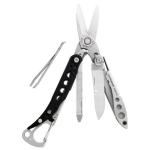 This multi-tool has a lanyard hole and a secure clip attachment with hook and loop closure on the nylon sheath for added portability. When closed, the B66N-CP has a closed length of 4.6-inches, but an overall length of 7-inches. Created with the help of company founder and chief engineer, Spencer Frazer, this multi-tool delivers sophisticated style and performance, dependability and a safe option for carrying out multiple tasks that has won favor among industrial consumers, campers, law enforcement, and military that depends on its flawless performance to carry out the toughest tasks under the most adverse conditions. The SOG B66N-CP multi-tools offers superb locking mechanisms that are stronger, more reliable, and easier to access than other multi-tools, like the Victorinox. Due to its innovative design, the multi-tool multiplies the pressure made to the front end when the user needs to cut a variety of items evenly. Better yet, the tools inside the SOG B66N-CP can be replaced by the user by ordering the components they need at company’s web site. The tasks that can be carried out using this multi-tool are endless. With easy access to the pliers, the user can clamp on and extract small or hard to reach items from narrow and tight areas. The three-sided file can remove burrs from metal cabinet edges, and the wire cutters can even slice through a double strand barbed wire fence! For added convenience, the SOG B66N-CP multi-tool can be rearranged so that the tools will not accidentally get wedged or hung up with one another. Overall, this multi-tool comes in handy for both indoor, outdoor or occupational use instead of having to walk back and forth to the tool box. 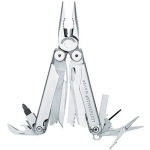 It is a very durable, user-friendly tool that is a great bargain at the price with more torque than standard multitools. The SOG B66N-CP gives easy access to blades and accessories without having to open and close the tool every time. Finally, it is designed in such a way that looks less intimidating to the general public compared to an “official” pocket knife.